Eustoma Lisianthus dbl. Rosita Hot Pink is a tall Pink cut flower with multiple bell shaped flowers. Approx. 75cm & wholesaled in Batches of 10 stems. Very popular for wedding flowers and flower arrangements. Eustoma, (also known as Lysianthus, Lisianthus, Texas Bluebell, Prairie Gentian or simply 'Lizzy' in the trade), is a genus of the Gentianaceae family. Eustoma has slightly succulent leaves and multiple bell shaped flower heads. 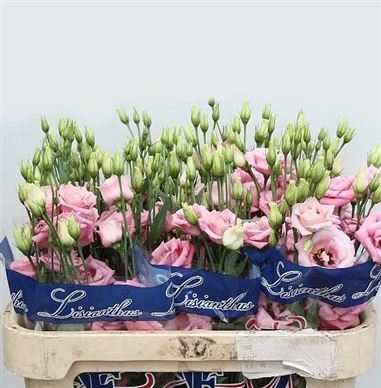 Eustoma is a very popular flower on the wholesale flower markets and is grown in great quantity. It is now available just about all year round and is used extensiveley in vintage wedding flowers.